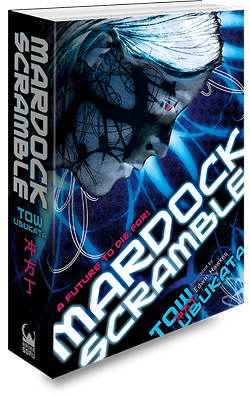 ﻿ MARDOCK SCRAMBLE « Haikasoru: Space Opera. Dark Fantasy. Hard Science. Why me? It was to be the last thought a young prostitute, Rune-Balot, would ever have...as a human anyway. Taken in by a devious gambler named Shell, she became a slave to his cruel desires and would have been killed by his hand if not for the self-aware Universal Tool (and little yellow mouse) known as Oeufcoque. Now a cyborg, Balot is not only nigh-invulnerable, but has the ability to disrupt electrical systems of all sorts. But even these powers may not be enough for Balot to deal with Shell, who offloads his memories to remain above the law, the immense assassin Dimsdale-Boiled, or the neon-noir streets of Mardock City itself. Mardock Scramble is now on Kindle! Born in Gifu Prefecture in 1977, Tow Ubukata was exposed to a blending of cultures from early childhood until the age of fourteen, having lived in Singapore and Nepal because of his father's work. In 1996, while in college, Ubukata won the first Sneaker Taisho Gold Prize for his novel Kuroi Kisetsu (Black Season) and thus debuted as a writer. In 2003, he won the Nihon SF Taisho Award for Mardock Scramble, originally published as a three-volume series. He is involved in a wide range of projects including anime production for Fafner, video game production, and original content writing for manga such as Le Chevalier D'Eon. His other works include the Bye-Bye Earth and Spiegel novel series. In 2009, he published his first historical novel, Tenchi Meisatsu, focusing on an Edo period mathematician. Soon the video began. The picture was noticeably grainy, and it was obviously a cheap flick. As a movie it was barely watchable, but when the girl appeared the gang were glued to their seats. They watched the girl as she lay still and was used every which way, and the suddenly the room was full of the most unbearable tension. Rare was next to speak. “Magnificent hair. Her skin looks wonderful too. I want her. I want her badly.” His voice was so shrill.